The “furnace of fire” mentioned in v42 is a reference to Gehenna, the lake of fire, on Judgment Day on a future Yom Kippur after Christ’s millennial reign as is documented in Revelation 20:7-15. Deuteronomy 16:1 “Observe the month of Abib and celebrate the Passover to the Lord your God, for in the month of Abib the Lord your God brought you out of Egypt by night. 2 You shall sacrifice the Passover to the Lord your God from the flock and the herd, in the place where the Lord chooses to establish His name. 3 You shall not eat leavened bread with it; seven days you shall eat with it unleavened bread, the bread of affliction (for you came out of the land of Egypt in haste), so that you may remember all the days of your life the day when you came out of the land of Egypt. 4 For seven days no leaven shall be seen with you in all your territory, and none of the flesh which you sacrifice on the evening of the first day shall remain overnight until morning. 5 You are not allowed to sacrifice the Passover in any of your towns which the Lord your God is giving you; 6 but at the place where the Lord your God chooses to establish His name, you shall sacrifice the Passover in the evening at sunset, at the time that you came out of Egypt. 7 You shall cook and eat it in the place which the Lord your God chooses. In the morning you are to return to your tents. 8 Six days you shall eat unleavened bread, and on the seventh day there shall be a solemn assembly to the Lord your God; you shall do no work on it. 9 “You shall count seven weeks for yourself; you shall begin to count seven weeks from the time you begin to put the sickle to the standing grain. 10 Then you shall celebrate the Feast of Weeks to the Lord your God with a tribute of a freewill offering of your hand, which you shall give just as the Lord your God blesses you; 11 and you shall rejoice before the Lord your God, you and your son and your daughter and your male and female servants and the Levite who is in your town, and the stranger and the orphan and the widow who are in your midst, in the place where the Lord your God chooses to establish His name. 12 You shall remember that you were a slave in Egypt, and you shall be careful to observe these statutes. 13 “You shall celebrate the Feast of Booths seven days after you have gathered in from your threshing floor and your wine vat; 14 and you shall rejoice in your feast, you and your son and your daughter and your male and female servants and the Levite and the stranger and the orphan and the widow who are in your towns. 15 Seven days you shall celebrate a feast to the Lord your God in the place which the Lord chooses, because the Lord your God will bless you in all your produce and in all the work of your hands, so that you will be altogether joyful. 16 “Three times in a year all your males shall appear before the Lord your God in the place which He chooses, at the Feast of Unleavened Bread and at the Feast of Weeks and at the Feast of Booths, and they shall not appear before the Lord empty-handed. 17 Every man shall give as he is able, according to the blessing of the Lord your God which He has given you. 18 “You shall appoint for yourself judges and officers in all your towns which the Lord your God is giving you, according to your tribes, and they shall judge the people with righteous judgment. 19 You shall not distort justice; you shall not be partial, and you shall not take a bribe, for a bribe blinds the eyes of the wise and perverts the words of the righteous. 20 Justice, and only justice, you shall pursue, that you may live and possess the land which the Lord your God is giving you. Author’s Note: In the pagan religions of antiquity, Asherah, which could be a wooden pillar, a sacred tree, or even a grove, was a representation of the “mother goddess” or “Queen of Heaven.” Likewise, cut stone pillars or obelisks essentially served as “divine” phallic architecture; God’s stone altars and memorials were ALWAYS of uncut stones. If Yahoah, the preincarnate Christ and firstborn of Creation, hated these, then why is “Mary” referenced as the “Queen of Heaven” in Roman Catholicism and Greek Orthodoxy and an Egyptian obelisk is the centerpiece of St. Peter’s Square? A good representation of the latter may be found here. It is because ancient paganism has been assimilated and still remains in certain churches. Numerous pagan “mysteries” were incorporated well before the Reformation and spread to other denominations unchecked — many of those “mysteries” remain to this day. As will be discovered, that applies to even the date of Christ’s birth. He observed the final day of Unleavened Bread — an annual Sabbath — at the right hand of the Father on 21 Abib. This article is developing the reasoning for the inclusion of the Feast of Weeks, which has also been fulfilled; a synopsis for the reasoning will be provided in the conclusion. How does one marry a city? I have no idea; that will be one of the things revealed to those invited to the Marriage Supper. But, He is certainly not “marrying the church,” and He certainly did not secretly marry Mary Magdalene and have a child with her. Bottom line: All Israelite males were to make a pilgrimage to Jerusalem to witness these events firsthand. THAT is the reasoning behind the Shalosh Regalim — fulfillment of prophesy and recognition of Israel’s Messiah (Heb. Mashiach). To become a member of The Way required a public repentance of sin via a tevilah (=full body immersion) in a miqveh (=a gathering of “living water” with a natural spring as its source). This is why Yochanan was overseeing these immersions in the Jordan River; it has a natural spring at its source — the Banias at the foot of Mount Hermon. The Jews were converting from false sects of Pharisaism and Sadducism to The Way. This was the TRUE church — “to the Jew first and also to the Greek,” where “the Greek” refers to believing gentiles. Author’s Notes: The phrase “set His paths straight” is referring to setting the record straight — to proclaim the truth; Christ is the one and only way. This is exactly what the two witnesses of Revelation, Enoch and Elijah, will do, and the world at large will REJECT the truth! Except for a remnant, the world will celebrate their deaths to the point of exchanging gifts (Revelation 11:3-13 concentrating on v10). 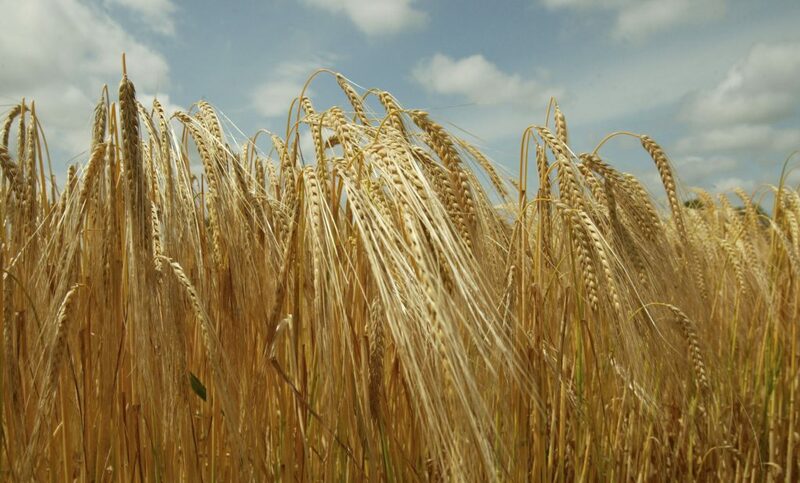 Also, compare the Parable of the Wheat and Tares in the section above to the wheat and chaff in this passage. Those not written in the Book of Life will be thrown into Gehenna, the lake of fire, and experience the second death. Of course, Saul’s conversion was well known (Acts 22:1-16), but never is it taught in our churches and synagogues that he converted to The Way. God’s covenant with Israel to lead them out of Egypt to the Promised Land with the visible signs of the tablets containing the Ten Commandments given to Moses as well as the pillar of cloud leading them by day and the pillar of fire by night (primarily Exodus 20, 34 concentrating on chapter 34:10-28 and Deuteronomy 4-5, 10 for the Ten Commandments as well as Numbers 14 for the pillars of cloud and fire). God’s New Covenant to count believing Gentiles as adopted sons of Israel (Romans 8-9, Galatians 4, Ephesians 1) with the allegory of the wild olive tree being grafted into the natural (Romans 11). *Note: The nations from Isaac and Ishmael have and will be embattled with one another until the end (as are the descendants of Jacob and Esau, but that’s another story). For nearly two millennia, “Biblical scholars” and “theologians” have stated that the Bible does not definitively state when Christ was born. Before the discovery of the DSS and the calendar contained therein, that was certainly true. However, now there are no excuses; all is being revealed in the Latter Days just as was prophesied (Matthew 10:26-28). So, how did these great “scholars” and “theologians” arrive at a December 25th date, which is inconsistent with the Scriptures? False church traditions (unsubstantiated embellishments), the precepts of men (manufactured theology), and doctrines of demons (assimilated paganism) cloud the truth regarding Christ’s conception and birth. For starters, one needs to review the program entitled “Christmas Unwrapped: The History of Christmas” from when The History Channel actually presented history. Note: I have no affiliation with this minister or church, and the minister died in 2009. Many “Biblical scholars” discounted the Lucan account because of the mention of Lysanias, the tetrarch of Abilene, in Luke 3:1; they assumed it was this figure from circa 40-36 BCE. That was before the discovery of the Corpus Inscriptionum Graecarum (CIG) 4521. Again, the Word of God was vindicated as it repeatedly is via archaeology. Furthermore, when the Book of Luke is placed within the context of the calendar of the Dead Sea Scrolls, not only can one know with GREAT CERTAINTY the month, day, day of the week, and year when Joshua* (Heb. Yehoshu’a/Aram. Yeshua/Gr. ‘Iesous) was born incarnate but when John (Heb. Yochanan) and He were conceived. Fact #1: Elisheba was six months pregnant in the sixth month; see Luke 1:26-38 concentrating on vv26 and 36. Fact #2: Zecharias (Heb. Tsekharya) was a Levite of the order/division of Abijah; see Luke 1:5-7 concentrating on v5. Fact #3: The mute and shaken Tsekharya returned home immediately after his weekly course was completed, and Elisheba conceived a son; see Luke 1:8-25. Fact #4: This is the calendar documented in the Dead Sea Scrolls, and it was employed by the “sect” called The Way during Christ’s incarnate life. Suggestion: You may want to print this out. Fact #5: For Elisheba to be six months pregnant in the sixth month, Tsekharya (of the course of Abijah) had to have served in the twelfth month. The only time this occurs is from the 14th-20th; see Cycle of Priestly Divisions from Calendrical Documents 4Q320 and 4Q321 > Division Year 3 of 6 in the Qumran calendar from Fact #4. Fact #6: As Tsekharya (and Elisheba) were righteous and walked in ALL requirements and commandments of the Lord (Luke 1:6), he could not have traveled more than a Sabbath day’s journey (2,000 cubits) on the 21st of the 12th month, which was a weekly Sabbath. Fact #7: The first day that Tsekharya could have returned home (likely Kiriath Arba — modern day Hebron — in the hill country of Judah) was the 22nd of the 12th month on the first day of the week. This was the day that John (Heb. Yochanan) was conceived. Fact #8: After Mary’s (Heb. Miryam) visitation with the archangel Gabriel (Heb. Gavri’el) in the sixth month (Luke 1:26), she left IN A HURRY to visit Elisheba (Luke 1:26-39). At the moment of arrival, Elisheba was overcome by the Holy Spirit and knew that Miryam had conceived a child (Luke 1:39-55). 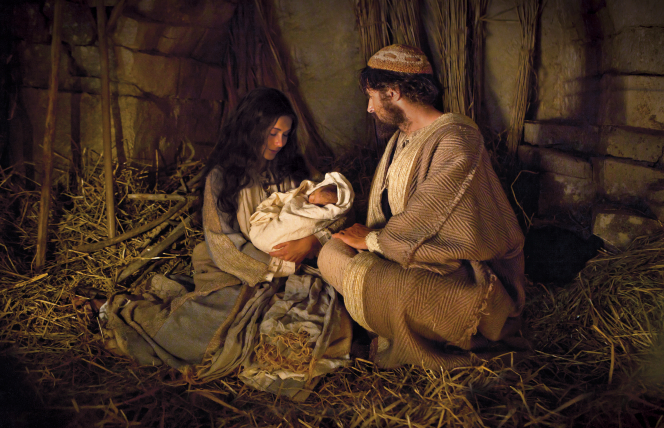 Fact #9: Exactly six months after Yochanan was conceived, Joshua (Heb. Yehoshu’a) was conceived. According to the Qumran calendar, that would have occurred on the 22nd of the sixth month on the first day of the week, which is the Feast of New Oil (Heb. Chag Yitzhar)! Fact #10: The gestation period for women is 38 weeks from CONCEPTION (not to be confused with last menstrual period or LMP) to birth. EXACTLY 38 weeks after Miryam conceived, Yehoshu’a was born on the Feast of Weeks (Heb. Shavu’ot) on the 15th day of the third month on the first day of the week. Fact #11: Yehoshu’a was born in 6 CE during the census of Quirinius. For the Scriptural reference, see Luke 2:1-20 concentrating on v2. Sidebar: “Herod” was a dynastic title like Caesar and Pharaoh. The “Herod” at the time of Christ’s birth was Herod Archelaus; he was deposed that same year (after the “slaughter of the innocents” in Bet Lechem) and died in exile in 18 CE. When did the “holy family” return from Egypt after Herod [Archelaus] died? When Yehoshu’a was 12 years old (18 CE – 6 CE = 12 years)! Sidebar: The only verse in the Gospels that contradicts this account is Matthew 2:22. The earliest extant manuscript containing that verse is Papyrus 70, which is “a fairly reliable text, though it was carelessly written,” from the late third century CE. The “early church fathers” (Matthew 23:9) were already at work destroying the truth! Regarding “signs in the Heavens,” this was what the “wise men of the east” of Jerusalem (Heb. Yerushalyim) — 15 miles as the crow flies — in the desert wilderness of Qumran saw on the evening of Feast of Weeks in 6 CE. This was confirmed by our local planetarium in Baton Rouge. The “wandering stars” of Jupiter (representative of the Most High/Father) and Venus (representative of the virgin mother) as well as the conjunction with occultation of Uranus (representative of the Holy Spirit) and Mars (representative of the redemptive Suffering Servant of Isaiah 53) rose in the east in the constellation Pisces (representative of Israel). This “star” sign naturally moved from east to south towards Bethlehem as the evening progressed — just as the Scriptures state (Matthew 2:1-12). Note: The Planetarium software from Neave Interactive Ltd. no longer supports dates earlier than January 1, 1500 at midnight. False traditions such as Herod the Great’s being part of this narrative when he died in 4 BCE and the precepts of men creating the fanciful machinations of the three kings of Melchior, Caspar, and Balthazar HAVE ABSOLUTELY NO SCRIPTURAL BASIS! Who doesn’t think that the wise men of The Way in Qumran didn’t have the means to gift Joshua the Messiah (Heb. Yehoshu’a HaMashiach/Gr. ‘Iesous Christos) with gold, frankincense, and myrrh after the discovery of the Copper Scroll? Yochanan was conceived on the 22nd day of the twelfth month on the first day of the week in 4 CE. Yehoshu’a was conceived on the 22nd day of the sixth month on the first day of the week on the Feast of New Oil in 5 CE — exactly six months after Yochanan’s conception. Yehoshu’a was born during the census of Quirinius on the 15th day of the third month on the first day of the week on the Feast of Weeks (Shavu’ot) in 6 CE — exactly 38 weeks from His conception. Sidebar: As was discussed above, the Feast of Weeks is when the “sect” called The Way (Heb. HaDerech) in Acts and the DSS made new covenants. Christ’s birth ushered in the ultimate New Covenant! Josephus, Jewish historian and self-described Pharisee (Matthew 23), coined the derogatory term “Essenes” (=pious ones) that is applied incorrectly to this day! 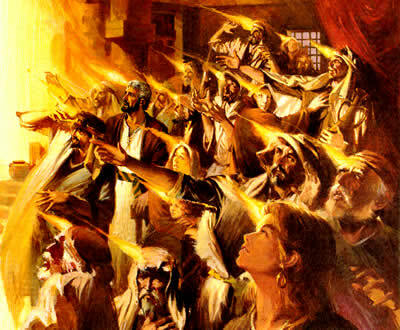 Acts 2:1 When the day of Pentecost had come, they were all together in one place. 2 And suddenly there came from heaven a noise like a violent rushing wind, and it filled the whole house where they were sitting. 3 And there appeared to them tongues as of fire distributing themselves, and they rested on each one of them. 4 And they were all filled with the Holy Spirit and began to speak with other tongues, as the Spirit was giving them utterance. What “sect” HAD ALL THINGS IN COMMON and “began selling their property and possessions?” Was it the Pharisees or the Sadducees? Certainly NOT! It was The Way. What changed on that day is that that the bodies of believers in Christ became the Temple and where the Holy Spirit resides — in circumcised hearts — is the Holy of Holies (1 Corinthians 6:19-20). The Bible states clearly that there are only TWO INTERCESSORS: Christ and the Holy Spirit (Romans 8:26-39 concentrating on vv26 and 34). Everything on this Earth of a mere shadow of what is to come! The Holy Spirit being sent in 36 CE to be our Helper and Teacher residing in the hearts of believers in Christ; He did not leave us as orphans. In most Christian churches we are taught that if we believe in Christ, upon death — we will immediately go to Heaven. We know with great certainty that is untrue! Even Christ’s soul descended into the Paradise of Heb. She’ol/Gr. Hades (Acts 2:22-36) before conquering death at His resurrection after three days AND nights. Is Christ a liar or are we being taught false traditions and the precepts of men — both of which we were warned against? 2 Peter 3:3 Know this first of all, that in the last days mockers will come with their mocking, following after their own lusts, 4 and saying, “Where is the promise of His coming? For ever since the fathers fell asleep, all continues just as it was from the beginning of creation.” 5 For when they maintain this, it escapes their notice that by the word of God the heavens existed long ago and the earth was formed out of water and by water, 6 through which the world at that time was destroyed, being flooded with water. 7 But by His word the present heavens and earth are being reserved for fire, kept for the day of judgment and destruction of ungodly men. “In 1700, Judah HeHasid led the largest organized group of Jewish immigrants to the Land of Israel in centuries. His disciples built the Hurva Synagogue, which served as the main synagogue in Jerusalem from the 18th century until 1948, when it was destroyed by the Arab Legion. The synagogue was rebuilt in 2010.” — Wikipedia, “History of Jerusalem” article, Early Ottoman period section. This is reiterated in Mark 13:14-23. How do we know that this is speaking of the Latter Days (modern times) and not the desecration and destruction of the Second Temple during the First Jewish-Roman War? Because of the immediate passages in Matthew 24:29-31 and Mark 13:24-27 that follow and were listed above. Has the sun darkened or the moon stopped giving light? Have the stars fallen from the sky or the heavens been shaken? No. But, they will as was prophesied. There it is — straight from the Word of God! NEW JERUSALEM IS THE BRIDE OF CHRIST! Think about it for just a second… If Christ were to marry the “body of Christ” (aka “the church”), then who would be invited to the Marriage Supper of the Lamb? New Jerusalem is the HEAVENLY KINGDOM that descends from the New Heaven to the New Earth! Study Revelation 21. We are NOT going to Heaven, folks. The domain of the Elohim (pl. of Eloah), or family/tribe of El the Father (aka “the sons of God”) is in Heaven. Because they are not of Earth, they are, by definition, extraterrestrials! The domain of humans (aka “the sons and daughters of men”) is Earth — whether the current incarnation or the New Earth that is to come. When we die, our souls go DOWN to Heb. She’ol/Gr. Hades awaiting resurrection. Just as Acts 24:15 states, both the righteous and wicked are resurrected; the wicked, who disbelieved in Christ, are judged by the Law of Moses, found guilty, and thrown in Gehenna, the lake of fire — thus, they experience the “second death” mentioned in Revelation 20:14b. Again, who is taught this in their church or synagogue? We know that Christ raised individuals from the dead with the most famous being Lazarus. There was a third, mass resurrection that occurred just after Christ’s resurrection on 18 Abib 36 CE, and they entered Jerusalem on that weekly Sabbath. Note: There is a three-day gap (15-17 Abib) between vv50-51 at His crucifixion on 14 Abib and vv52-53 at His resurrection on 18 Abib in 36 CE. Again, is this mass resurrection taught in your church or synagogue or is it glossed over entirely (just as the TaNaKh readings gloss over the Suffering Servant passage in Isaiah 53)? See more here. Start studying the Scriptures PLAINLY and SIMPLY, and its true meaning will be revealed to you just as it has to me. Quit relying on rabbis, pastors, ministers, priests, or whatever your clergy is called; they are just people who disregard the Scriptures — just like the Jewry has for millennia. They are promoting their own “brand of religion,” but it is not of God; lies mixed with the truth are still lies. The Holy Spirit was sent to be our Helper on the Feast of Weeks (aka Pentecost) in 36 CE. Also, Christ was born on that date in 6 CE. The following outline forms the basis of my second book tentatively entitled Apokàlypsis: The TRUTH Behind the Visions of Yochanan at Patmos. For the record, John was not “of Patmos;” he hailed from Ephesus. He was exiled to Patmos by the Roman emperor Domitian (Lat. Titus Flavius Caesar Domitianus Augustus) after allegedly being unharmed upon being immersed in a vat of burning oil in the Colosseum circa 90-95 CE. Although Tertullian was far from being an eyewitness, he did record this event in Chapter 36 of The Prescription Against Heretics. Regardless, PLEASE study this for yourself, and pray for the Seven Spirits of Yahoah. The mysterious name that calculates to be either 616 or 666 in Hebrew gematria or Greek isopsephy in Revelation 13:18. Most state that Revelation is not written in chronological order, but IT IS except for minor exceptions. For example, when the prophecy discusses the two witnesses of Enoch and Elijah in Revelation 11:1-6 vs. 7-13; verses 1-6 occur mid-Tribulation, and verses 7-13 occur towards the end. So, although vv7-13 are “out of order” overall, they complete the topic explained within the context of the chapter(s). That seems pretty straight-forward. If someone were on a long journey during Passover in the first month or they were unclean because of contact with a corpse, then they could observe this appointed time in the second month. Note: Few realize that the term translated as “alien” (Heb. ger[im]) in v14 above, is referring to Gentile proselytes to Judaism. Contrary to modern practice, this commandment has never ceased since the time of the Exodus (Gr. exodos; Heb. yetzi’at mitzrayim) from the land of Goshen (Genesis 45:4-11 concentrating on v10) in Egypt. Author’s Note: What I teach is foreign to many Christians, but we must remember that Yehoshu’a hailed from the tribe of Judah (Hebrews 7:14). For those who want to understand my motivation and desire to teach, re-read Matthew 5:19b in bold above. I will be the first to admit that I have problems keeping the Law, but I am also a Gentile who is under Grace; therefore, I am to abstain from four things determined at the First Council of Jerusalem by Christ’s step-brother Ya’acov [=Jacob; mistakenly called James] (Acts 15:1-29 concentrating on vv19-20 and 28-29). So, why was there not a “second chance” for Shavu’ot or Sukkot? Because Pesach Sheni represented foreshadowing of things to come during Christ’s crucifixion! Recall that Christ is the paschal Lamb of God (John 1:35-36; Revelation 5:6, 6:9, 7:17, 14:10, 15:3, 19:9, 21:23, 22:1, 22:3) who was crucified on Passover (14 Abib), aka Preparation Day, in 36 CE. For more on the “seven Spirits of God” referenced in Revelation 5:6, see here. Joseph of Arimathea and Nicodemus were unclean with certainty as Joseph took possession Christ’s corpse with Pilate’s permission, and Nicodemus anointed His corpse with myrrh and aloes. It is highly likely that His mother Mary, Mary Magdalene, Mary the mother of James and Joseph (wife of Clopas? ), the mother of the sons of Zebedee (James and John), and Salome were rendered unclean as well. Although Second Passover is explicitly applicable to the two men, women also partake of the Passover; therefore, it would be applicable to all. One parting thought… Most Biblical scholars and theologians teach that Christ’s ministry lasted 3-1/2 years as three Passovers are mentioned in the Book of John. Since most of these “scholars” believe they are of “New Testament-only churches,” they dismiss Torah. Again, what did Christ say in Matthew 5:17-19? Is He a liar? Absolutely not. What they miss is that one of those Passovers is the Second Passover; therefore, His ministry lasted a little over 1-1/2 years. That fact will be discussed in detail on the day leading up to the Feast of New Wine on July 22nd. In addition, Jewish storytelling is typically NOT in chronological order. The storyteller gives a piece here and there — much like a patchwork quilt — having all the pieces being interwoven at the end to complete the story. This is witnessed throughout the OT and is certainly the case with the Book of John. Only the Book of Luke — and by extension Acts — is explicitly written in chronological order based on eyewitness accounts (Luke 1:1-4 concentrating on vv2-3). Be sure to check out the new Recommended section on the main menu of HaDerech! It contains Fundraising opportunities for donations, Internet Resources links for research purposes as well as my favorite Reading and Videos. This will be updated frequently. Enjoy! 22nd of the sixth month (olive oil) – Feast of New Oil (Chag Yitzhar). What is interesting is that Rabbinic Jews — with their “wise sages” — interpret “on the day after the sabbath” in Leviticus 23:11 to mean the first sabbath after Chag HaMatzot begins. The Dead Sea Scrolls made it abudantly clear that it was referring to the first sabbath after the Feast of Unleavened Bread ends. They also recognize the fig, pomegranate, and date harvests which are extrabiblical. That is exactly what happens when “learned men” attempt to discern the Scriptures for themselves instead of reading them plainly and simply. 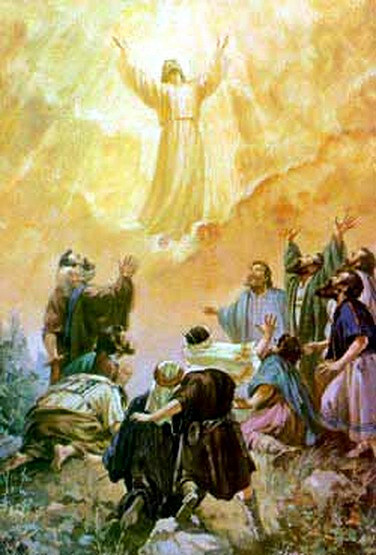 In 36 CE, Christ had ascended to Heaven for the first time the day before and spent this day resting at the right hand of the Most High. All three passages may be read here for your convenience. As was discussed in yesterday’s article 19 Abib: Christ’s Empty Tomb Discovered, the account in Mark 16 is spurious as that passage was not found in early manuscripts and contains false information about the day of His resurrection in v9; see the footnotes for vv9 and 20. This was the day that the Great Commission was issued and when Christ ascended into Heaven at Bethany in Galilee in Luke 24:50-53. This was also the day before the annual or High Sabbath that marked the closing of the Feast of Unleavened Bread on 21 Abib. On that day, He rested with His Father in Heaven. Author’s Note: The “church of God” that Saul (Heb. Sha’ul) persecuted in v9 was the “sect” called The Way (Heb. HaDerech) documented in the Dead Sea Scrolls; see Acts 9:1-31; 19:8-10,23-27; 22:1-16; and 24:1-16 focusing on vv14-15. The two witnesses of Revelation, Enoch and Elijah, will fill in the gaps for those believers who endure to at least mid-Tribulation.